Materials in Conservation is the definitive introduction to the properties of materials used in conservation. The continual struggle of conservators to ameliorate the deterioration of objects has led to increasing use of synthetic polymers. These materials are part of the sophisticated technology that has been developed to augment and often replace traditional materials and methods. Conservators therefore have a wider range of techniques available. However, they must be able to appreciate the potentials and pitfalls of any proposed technique. The first section explains physical and chemical properties which are important in the conservation process, i.e. application, ageing, reversal. The topics covered include molecular weight, glass transition temperature, solubility and solvents, polymerisation and degradation reactions. The second section provides a detailed consideration of the individual materials, current and obsolete, used in conservation, drawing out the factors relevant to their effects on objects. The conservation uses of each material are summarised and referenced to allow further study. In five appendices, the properties of the polymers, solvents and their interactions are tabulated, with a list of suppliers and conversion table of physical units. IUPAC and SI nomenclature is used throughout the book. 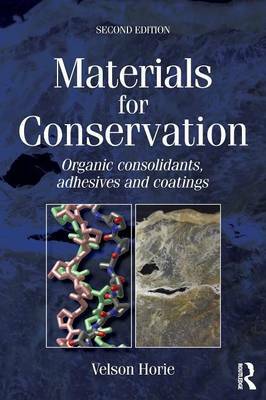 In this second edition, this classic text is revised and updated to include modern materials such as cyclododecane, and current ideas on adhesion, consolidation and reversibility, making Materials in Conservation the definitive source of vital information in the field. This handy reference book should be on the bench of every conservator and available wherever objects, from steam engines to dried plants, are preserved.